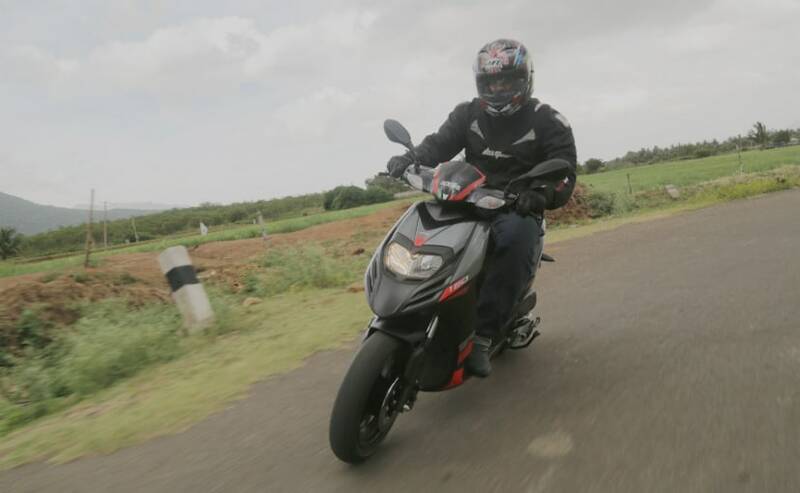 It is a great day to ride the Aprilia SR 150, perhaps the most radical looking scooter in India at present. The sky is overcast, bearing dark clouds which are bursting at the seams with moisture. Almost on cue, a strong gust of wind comes along and is threatening to uproot the bushes and the small trees. The lush green hills of the Nilgiris range all around and the whole setting is very surreal. Whoosh! A devilish looking contraption on two wheels zooms past me and it snaps me into reality. And then I realise that my colleague is signaling me to get on with it and give him the riding shots that he needs. 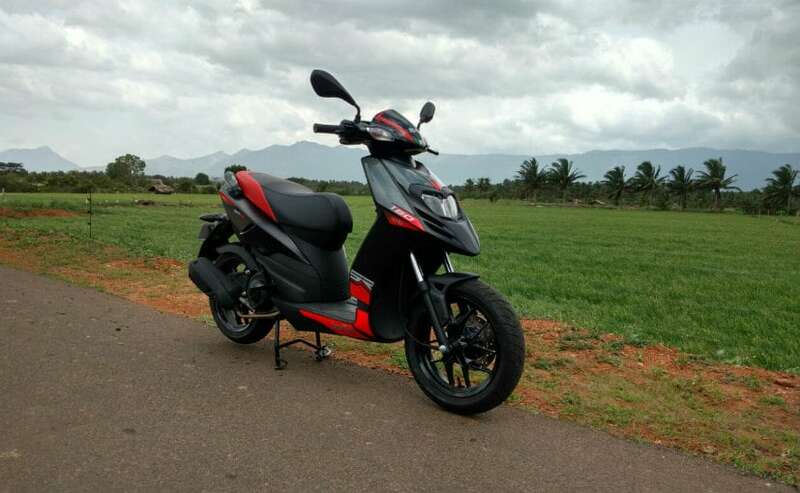 We were invited to Coimbatore by Piaggio to test ride Aprilia's first ever scooter to be launched for Indian markets and the good news is that you can own one soon for ₹ 65,000 only. But why shell out that kind of money on a scooter? Here's why one should. 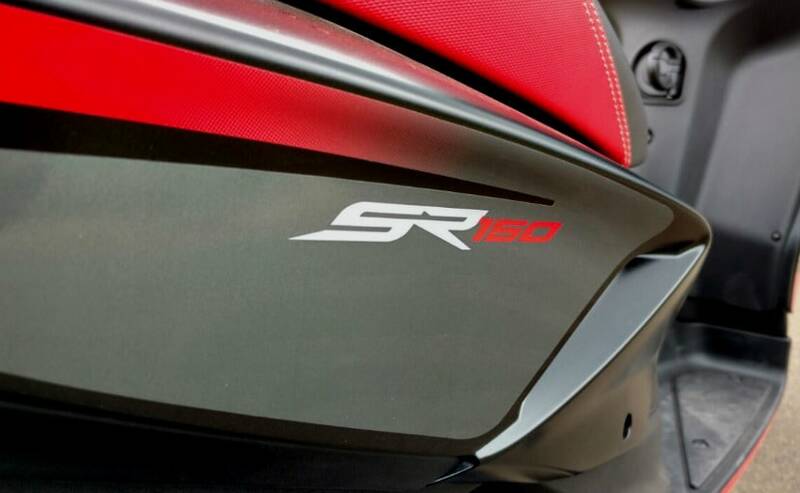 Edgy, stylish and chic were the words that popped into my head as I first chanced upon a glance at the SR 150. The lines are way different than those on any regular automatic scooter on offer in India. There is this sense of defying every norm that exists for your regular run-off-the-mill scooters, oozing from every nut and bolt of the SR 150. The front apron ends into a pointy, beak-like finish with those angry-looking headlamps that give the scooter an aggressive stance and solid street presence. Then comes the fat Vee 120/70 14-inch tyres that are made in Thailand, which again adds that definition to a muscular front end. Viewed in profile, the scooter throws up splashes of red on a matte black trim with sporty decals lettered across the body. The rear end again culminates in a pointed tail lamp topped by split grab-rails and a dual-tone seat done in black and red. As far as looks are concerned, this baby scores a perfect 10. While the looks could definitely kill, the features list undermines the lovely looks of the scooter. 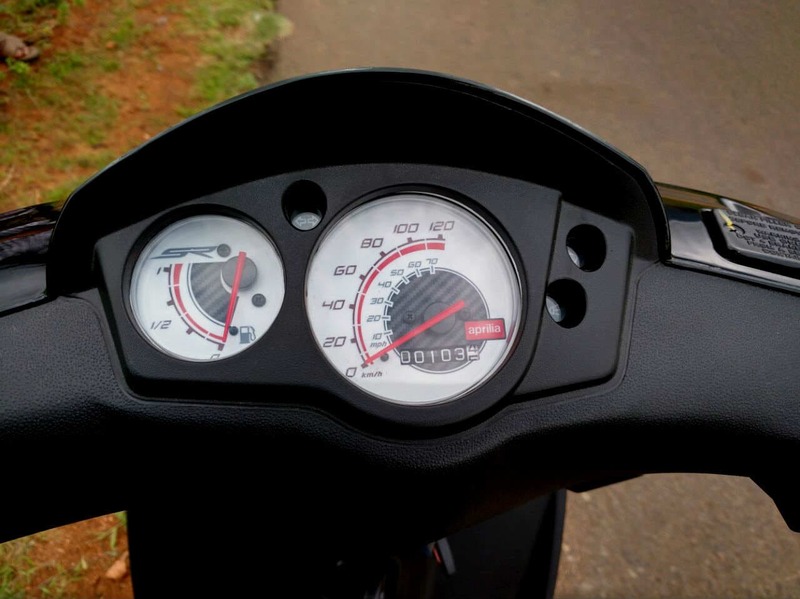 It is a premium scooter to say the least and could have definitely done with a sportier looking instrumentation console (digital maybe, even if partly) and a side-stand (optional). For a premium scooter, one could surely want a bit more kit. 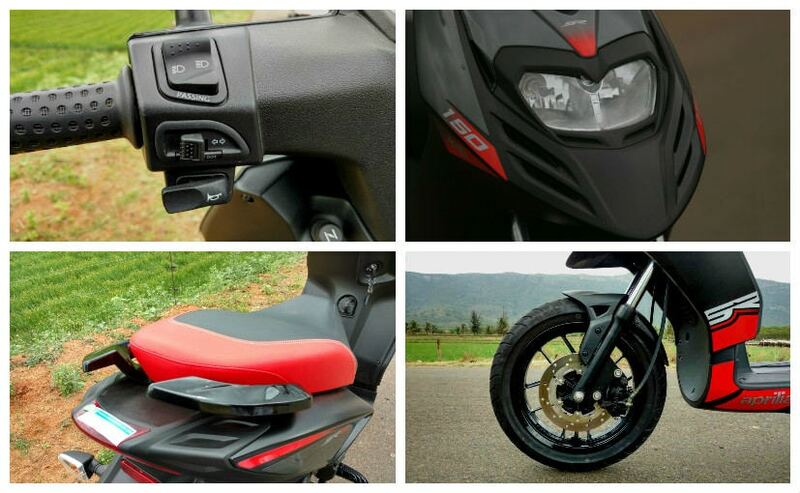 Although, there is a pass switch (extremely helpful while riding at night) and footpegs that fold and fit flush for the pillion rider which are the cooler bits on the scooter. Perhaps the biggest letdown is the fit and finish. There are places where the wiring is exposed and the panel gaps just become an eyesore. The quality of plastics could have been better too. But then we are told that this is a pre-production model so we will give the benefit of doubt to Aprilia and hope that these small niggles are taken care of. 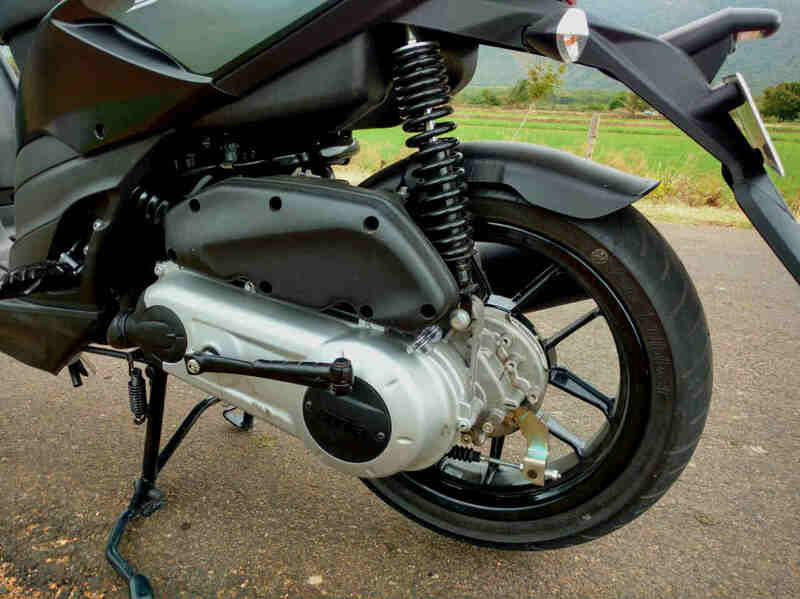 The engine on the SR 150 is similar to that on the Vespa 150, churning out a peak output of 11.4bhp and 11.5Nm of peak torque from a 154.4cc engine. It is not the numbers which caught my fancy, it is way the SR 150 made use of those numbers and put a grin on our faces. There is this rush of torque in the mid-range which accelerates the Aprilia quicker than any other scooter that I have ridden till date. The performance packs a punch and on daily commutes, can show a clean pair of heels to quite a few commuter motorcycles and most (almost all) scooters. Grab a handful of brakes and the 220mm disc upfront with a 2-piston Bybre caliper along with a 140mm drum at the rear ensures that the scooter stops on time with minimal drama. Of course, they do lock up under severe braking. But if that is the case then you already are in a tight spot. The only concern is that the engine is really vibey when idling, which might be bothering for some people. But not something that will make you turn away from this beauty. The SR 150 gets a telescopic suspension upfront and an off-set monoshock at the rear along with fat 120/70 14-inch tyres at both ends. The ride is a tad too stiff for our liking and continuous riding on bad roads might be a harassing experience. The scooter handles decently enough and does not shy away from corners. The wheelbase could have been shortened by a wee bit by reducing the trail of the suspension upfront and thereby sharpened the handling a bit as well. But then, this is merely nitpicking. We will say yes! Firstly you get a radical-looking scooter from a thoroughbred manufacturer of performance motorcycles at a great price ( ₹ 65,000). Secondly, the performance is unerring. You twist the throttle and the SR 150 will obey your command to go fast instantly. Thirdly, it will make you the talk of the town because it is a gorgeous looking scooter (for the umpteenth time). It is one of those decisions wherein the heart takes over the head. The SR 150 has its share of problems but none so that it might be a deal-breaker. The present scooters in India are soon going to develop a complex of sorts. In short, Aprilia is a brand of Piaggio's and it makes everything from stylish and powerful scooters to high performance litre-class motorcycles. Although Piaggio has been in India for a while now, with its Vespa range of scooters, which followed a retro design theme, the Aprilia brand of scooters on the other hand, are fiercely modern, edgy and a far cry from the retro-themed but good-looking Vespa models. India has always shied away from scooters which have a displacement of more than 125cc. 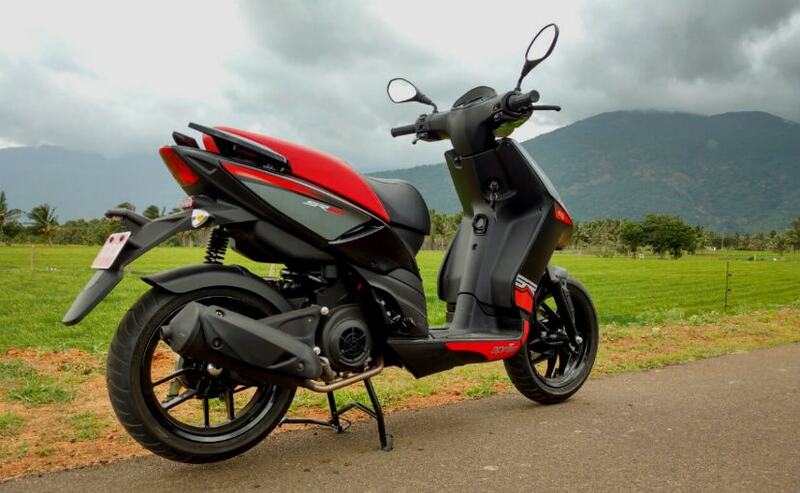 And at present, there are only two scooters which have a 150cc engine in India, the Vespa 150 and the SR150, two models which have a similar lineage. The SR 150 should make its way to Vespa dealerships across the country in fortnight's time. From what we hear, the production has already begun at Piaggio's Baramati plant in Maharashtra. At a very affordable price of ₹ 65,000 we cannot see how a better piece of investment can be made. Should you be a scooter enthusiast that is.